SeeMore’s xSeries is a “prototype” series made in a limited number with the idea of extending distribution into the international market. All have the line and red dot proprietary alignment system they callRifle Scope Technology for which they are justifiably well known. 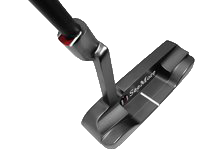 Each of the xSeries also has a lightweight TPU insert made by pouring the plastic TPU material into a cavity in the putter face where as it hardens and cools it bonds with the steel of the putter head. The x2 Nickelfeatures is a slightly oversize, blade-style putter that also will appeal to those wanting a small mallet putter. The x2 has a singleline on the top and two perpendicular lines on the back flange for additional alignment benefits. RetailPrice of the x2 is $195. 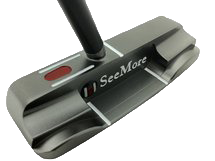 The x3 Nickel has a full mallet head with one perpendicular line on the top and two on the back. It carries a retail price also of $195. Finally the x4 Nickel is a familiar offset hosel design with two parallel lines at the top of the ferrule. 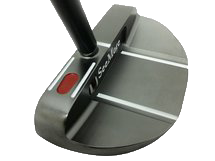 As with the other xSeries putters retail is $195.